The modern revival of masquerade masks is deeply rooted in craftsmanship and the artistic qualities of the masks. While these agents of disguise originated in Venice they have been welcomed in other parts of the world including the rest of Europe and the Americas. Each region has its own style and culture surrounding these masks. When masquerades were popular, Venetian mask-makers, or maschereri, established a guild in the early 15th century and began producing decorative masks. Attention to detail was a critical part of creating these masks and there was a range of types and styles. There are three different types of masks including the Bauta, Moretta and Larva. Bauta: These masks were originally created for the Carnival and they come in two forms. One covers the entire face while the other covers the upper area of the face. 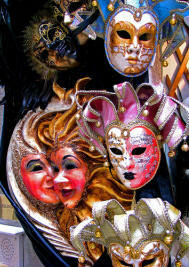 Moretta: These masks originated in France and were constructed using black velvet. They were worn by women who visited convent and were attached to a veil. Larva: Also known as the volto, these masks were typically white and originated in Venice. The shape is similar to the Bauta but the mask itself is made of wax cloth. They were more comfortable for dancing, eating and mingling. The original mask was created by Venetians and the mask-makers used two different methods. Papier mache was the first method which combined glue and paper strips to form the shape of the mask. These masks were generally designed to be held by a stick and to only cover the eyes. In order to create full-face masks, the artists used clay to produce molds. The mask-makers applied specialized paint and added all sorts of decorative elements including gems, beads, ribbons, natural feathers and dazzling gold leaf. Color was a significant part of the design. Bright blues, reds, yellows, oranges and greens were the most common choices. Generally, males would wear darker colors while women would wear lighter ones. Customized masks were also possible, resulting in a vast array of unique masquerade masks. The masks were accompanied by highly elaborate and ornamental masquerade costumes during the celebrations. The original masks were symbolic and simple. Over time, masquerade masks became more and more complex. Masquerade masks have not only been used for entertainment but they have also allowed people to hide their identities in order to participate in various activities including romantic ventures and even crime.